Some musicians are one-hit wonders and their music winds up in sales bins packed into CDs labeled “Hits of the ’60s” (or ’70s or ’80s). Other musicians last longer with entertaining dance beats that keep their music in more frequent rotation. But, Pete Seeger’s music is in another category entirely: He had hits; he got people up on their feet; but he was most interested in moving our hearts. For example, Pete (and he always wanted to be called just “Pete”) collaborated with Amnesty International on a classic Bob Dylan tune “Forever Young,” joined by the Rivertown Kids, a school-age music group from Pete’s home community. For our Summer 2014 World Music Festival—here at Interfaith Peacemakers—I’m sharing two videos related to that performance. The first video screen is the story behind that recording. The second screen is the song itself. This is classic Pete–a 90-year old and pre-teens making great music together across the generations—drawing on a hit by a musician who was inspired by Pete’s music from ages ago. Pete died January 17, 2014—and below the two video screens you’ll find various tributes to Pete’s amazing life. His music still is ringing strongly among us. From Daniel Buttry in early 2014: After I heard the news that Pete Seeger had died on Monday (January 27), I immediately began seeing tributes from friends. Singer-songwriter and peacemaker David LaMotte (who wrote a profile of Imam Abdullah Antepi for this series) posted an inspiring profile of Seeger. 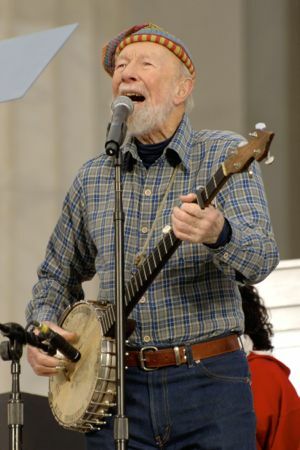 David told about preparing for a concert with Pete Seeger and discovering, before the crowd arrived, that Seeger decided to rearrange the audience’s seating—personally. After the song was cut by network censors, the Smothers Brothers went public, generating more attention for the issue than CBS had expected. The network relented, and the song was aired with 7 million people viewing it. Waist Deep in the Big Muddy conveyed a powerful image to Americans who were getting frustrated and disillusioned by their nation’s growing involvement in the swamp of the Vietnam War. Seeger was active in the South during the civil rights movement of the 1950s and 1960s. He chronicled the songs that were such a significant part of the movement and spread the stories of the civil rights activists around the country through his concerts. I’ll Be All Right was a gospel hymn sung in black churches throughout the South. In a 1946 strike at a South Carolina tobacco factory, the song-leader, Lucille Simmons, slowed down the tempo and pluralized the last verse: “We will overcome.” When some of the strikers attended the Highlander Folk School later in the year, Highlander’s music director Zilphia Horton picked it up and later taught it to Seeger, who added a verse or two. Along the way “will” was changed to “shall,” perhaps by Septima Clark. At the 25th anniversary celebration of Highlander, the Rev. Dr. Martin Luther King, Jr. was one of the participants. When Seeger led the singing, King said, “We Shall Overcome—that song really sticks with you, doesn’t it?” Guy Carawan had learned the song from Horton and in 1959 followed her as music director at Highlander. He taught it at a “Singing in the Movement” workshop and then at the organizing meeting of the Student Nonviolent Coordinating Committee (SNCC). The tradition of holding hands with crossed arms and swaying as people sang was started at the SNCC meeting. In 1963, Seeger recorded the song at his Carnegie Hall concert, and the anthem quickly circled the world. The creation and spread of We Shall Overcome was a typical Pete Seeger experience: a bit of tradition; a contribution from this person and that; and an adaptation for a contemporary setting so anyone could sing it. Seeger was born to professional musician parents trained in European classical traditions. His mother left musical instruments around the house for him to pick up and explore. He learned by feel and ear before he knew technical terms. As a college student, he fell in love with the 5-string banjo, and eventually wrote the classic guidebook on how to play it. One of his first jobs was with the Archives of American Folk Music, which led him to find and learn from legendary musicians like Leadbelly. In 1940, at a migrant-worker benefit concert, he met Woody Guthrie, one of the most prolific American folk-song writers. Seeger, Lee Hayes and, later, Guthrie formed the Almanac Singers with some other musicians. The Almanac Singers played for union rallies and in support of strikes. In 1948, Seeger and three friends formed the Weavers, the group that helped to launch the folk music revival nationwide—but Seeger never left his activist roots. A year later, in 1949, he sang with Paul Robeson at a union concert as an “inoculation against fascism.” The Ku Klux Klan targeted the concert and stoned thousands of cars. As Seeger drove away from the concert with his wife and children, anti-union vigilantes attacked their car as well. Large rocks shattered the windows, sending glass shards into their hair and clothes. Seeger had joined the Communist Party in the 1940s in support of workers’ rights and the Communist vision of an equitable world. At the same time, he served a stint in the U.S. Army during World War II, mostly entertaining the troops. He left the Communist Party after a few years, but his involvement became a national issue when the House Un-American Activities Committee (HUAC) launched its investigation in 1955. Seeger appeared before the committee and defended his rights from the First Amendment—freedom of speech and association. He recalled the old German song, “Die Gedanken Sind Frei,” (“My thoughts are free.”) and he refused to directly answer the committee’s questions. This led to a citation of contempt and a sentence to a year in prison. His conviction was later overturned, but the HUAC hearings left Seeger blacklisted. As a result, he turned to what he called “guerrilla cultural tactics.” He would show up in a town with no advance publicity for a concert. First, he would play on a local radio station, then he would invite people to a concert that night. He would be on the road again before protests could be mobilized against him. During the civil rights movement and the growing anti-war movement in the 1960s, he became a popular singer. He had earned the respect of many for standing up for his principles in the face of threats of imprisonment and violence. While marching alongside them, he also challenged the generational divisiveness of young radicals, even recording a song, Be Kind to Your Parents. By the 1970s, Seeger had become a beloved musical figure from coast to coast. Seeger and his wife Toshi had purchased land and built a log house on a bluff overlooking the Hudson River in New York. In 1969 they helped start an organization that built a replica of an old sailing sloop, which the organization voted to call “Clearwater.” Using the “Clearwater” as a platform, Seeger took the lead in a movement of environmental cleanup of the Hudson. Environmentalism became a frequent theme in his concerts. Where we all can share. Watch Pete’s “Where Have All the Flowers Gone” in a 1968 concert in Sweden. Watch Pete sing “Guantanamera” in concert with his grandson. Watch Pete sing “We Shall Overcome” at a 1963 Civil Rights event.